The president of China is visiting Seattle this week (today is his last day), which got me reminiscing about our trip to China’s capital city, Beijing, EXACTLY seven years ago this week. 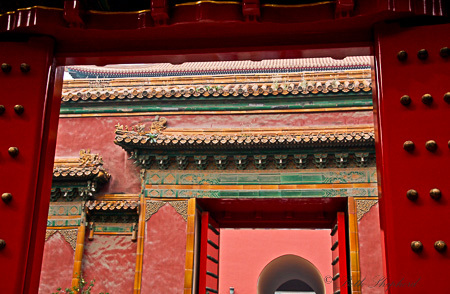 We spent three weeks in Beijing before taking an unforgettable 9-day tour of Tibet. 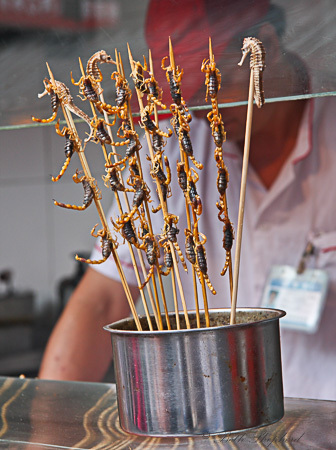 Eat some crazy food, like chicken feet, stinky tofu and yak lung. And drink a lot of tea, one time with an honest-to-goodness lama. 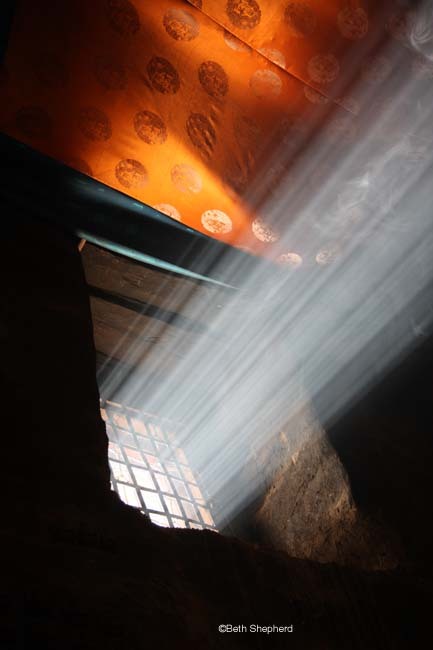 Visit places that were once forbidden for commoners. And abide by signs that forbid smoking now. 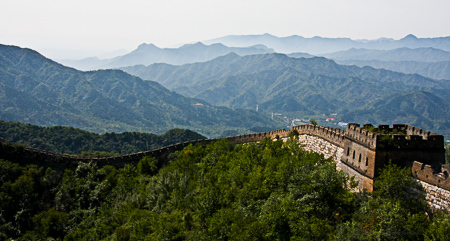 Look out to a never ending view from the Great Wall. And peer out the window, barely able to see the view through the smog. Check out sweet new rides. And traditional old rides too. 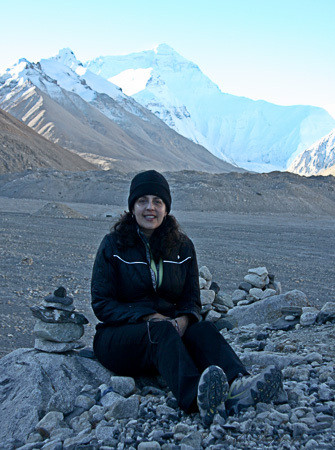 Stand before the Himalayan Mountains at 17,000 feet. Sit beneath the shadow of Mt. Everest. If you’ve ever visited Beijing (like we did in 2008), you’ll love this music video–Beijing State of Mind–made by a good friend of ours. Cool song, awesome video (way to go Mark! )…makes me want to hop on a plane and head right back over there. Severely jet-lagged but eager to enjoy my first meal in Beijing, Big Papa and I joined a few of his coworkers for dinner. As we strolled to the restaurant, we were treated to a lovely sunset on a relatively clear evening in September with air pollution at record lows. Lucky for us, the 2008 Summer Olympics had wound to a close just a few days before our visit. The Chinese made extraordinary efforts to cut down on traffic and pollution for the duration of the games. 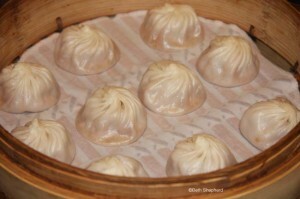 We arrived at Din Tai Fung, home of legendary xiǎolóngbāo, or soup dumplings. 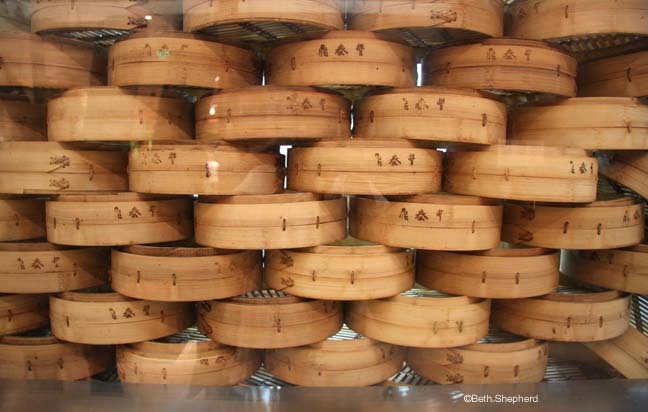 Soon baskets upon baskets of divine dumplings piled mile-high on our table, creating a miniature Great Wall of China between us and our dining companions. Din Tai Fung stood up to its reputation as one of the world’s top 10 restaurants in 1993 (according to the New York Times). Some dumplings have too much soup, not enough soup, skin too thick, skin that breaks upon chopstick contact and thus spilling the contents all over the table. Not Din Tai Fung. Little pillows of perfection melted in our mouths. Over the past two weeks, soup dumplings and potstickers have weighed heavily on my mind. Those little morsels of goodness were oh-so-tempting. But the question at hand was whether they were tempting enough to lure me away from my local farmer’s market and readily available organic produce for two to three years. That’s right, two to three years. Last week, if I’d written this post, I might have said that Big Papa and I were taking our show on the road…or more accurately overseas, to China. Pampers and Pakhlava would morph into Pampers, Pakhlava and Potstickers. Big Papa has been contemplating switching teams at his job for awhile now. He’s worked on his current team for five years and is itching for some new challenges. I am proud of him for checking out his options and exploring the possibility of new frontiers, however the offer to work in China seriously threw me for a loop. At first I was thrilled. I’ve longed to live overseas. 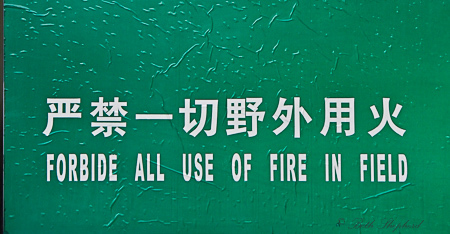 Granted, Beijing has never been on my short list. 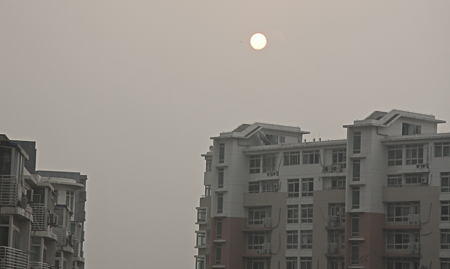 While I loved our three week stint in 2008, visiting Beijing would not be the same as living in Beijing. First, there’s the pollution, which I’ve heard can appear like a fogged-in Seattle morning, except the fog is filled with throat-burning toxins. Then there’s the traffic. People whine about rude drivers and rush hour drama in Seattle. You’ve got to be kidding me. We are amateurs. 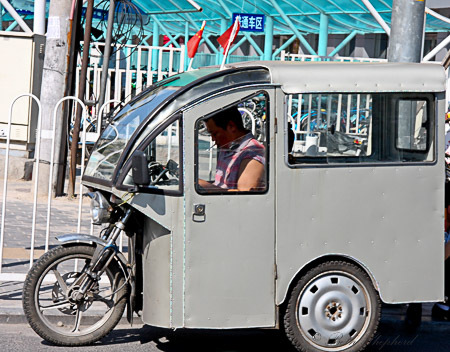 Drivers in China, Beijing in particular, are purportedly some of the worst in the world. During our stay, Big Papa and I spent most of our time with our hands over our eyes as our taxi driver played ‘chicken’ with a host of other taxi drivers. Stop signs and red lights were merely suggestions and rush hour traffic was as thick as molasses on a winter’s day. I also worried about the food. Between the Greenpeace expose on the chemicals found on fresh fruit and vegetables to the melamine scare of last year, China didn’t exactly have the best reputation for food safety. The same could be said for health care, with dubious standards at best. HIV is still in the blood supply and foreigners are advised to avoid blood transfusions if at all possible. Doctors are reported to reuse syringes and ambulances are hard to come by (not to mention somewhat worthless considering the impassible snarl of traffic on most days). Not to give Beijing a completely bad rap though, as my mind did wander to all the things I saw and did during our trip there two years ago. There are beautiful parks and wonderful historical sites. Days easily slipped by while I explored street markets and old, winding Hutong neighborhoods. Beijing also has an enormous expat community and I knew I might find many opportunities to meet fascinating people from all over the world, as well as connect with resources that would help ease our transition. I could learn Chinese, and pick up Tai Chi. Our beloved Tibet was practically right around the corner. Vacationing in the shadow of Mt. Everest or exploring Mongolia or the Yunnan sounded endlessly fascinating to me. There was so much to experience. 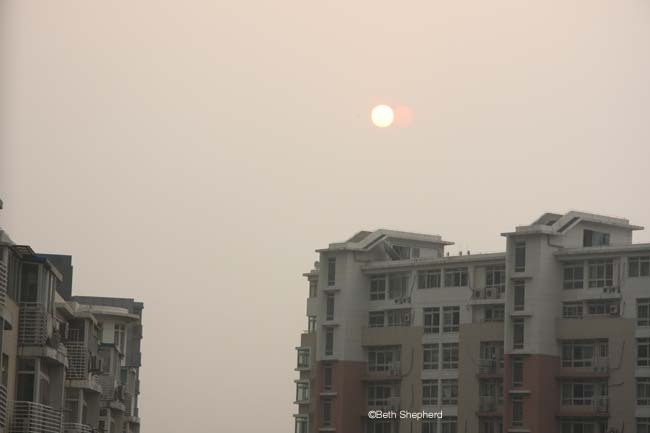 Aside from my concerns of life in China, I also felt sadness at the thought of leaving behind our lives in Seattle. What to do about Maggie, my sweet fifteen-year-old cat? Take her with us and put her through quarantine? Try to find the medications she needed and a decent vet? Or should we leave her in Seattle, assuming we could find a trusted friend to care for her. We’d just finished the remodel of the Urban Cabin and our backyard lay in wait to be replanted and enjoyed. My father too, was a consideration. He’s elderly, wheelchair bound and we’d moved him from Florida three years ago and into a Seattle assisted living facility to keep a closer eye on him. I felt a bit guilty about dragging him out here and then flying off to a city half the world away. And then there was the kiddo. Being a mom in China sounded like it could be fun, wheeling my kid through centuries-old parks and hanging out with other expat mommies. But I questioned what it might be like being a brand new mommy in a brand new country where I didn’t speak the language and if some catastrophe befell our kid, our world could go south in a big bad way, very quickly. As the week wore on doubts began to creep in between the excitement. We both had several sleepless nights tossing and turning as our brains debated the pros and cons of such an enormous upheaval to our lives. Back and forth we went. “Let’s do it” by day turned into “What if” by night. 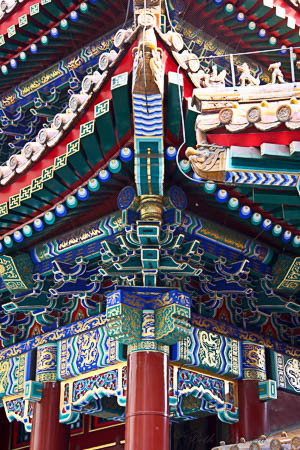 We read blogs, made calls, checked into Pet Transport, housing, Beijing organic grocers, ayi (nanny) services and expat taxes. Then, Friday morning, we got the call that changed it all. Why aren’t you adopting from Haiti? If I had a $10 for every time someone has asked me recently why we aren’t adopting from Haiti, I could probably fund the update to our home study (more on this in an upcoming post). Here’s the thing, even if we wanted to adopt from Haiti, we can’t. In the wake of the disaster in Haiti, the government isn’t fully functioning, so there is no way to process a Haitian child through the Haitian courts. For families who already are “matched” with a child and waiting for their court dates, this is heartbreaking, though when the government is up and running, hopefully they’ll get their day in court. As for new adoptions, they are not being processed at all. Had the earthquake not occurred, Big Papa and I still would not be able to adopt from Haiti. Since 1974, Haitian guidelines require that couples be married for ten years (single women, however, are allowed to adopt). Prior to the earthquake, some U.S. adoption agencies were hopeful that the adoption law pending in Haiti would pass, widening the guidelines and reducing the marriage requirement to five years. In our case, that would still prohibit us from adopting as we will hit three years this July. It’s not easy to adopt from Haiti, even when life there is “normal.” I know one woman, who lives nearby, whose [now] three year old daughter was adopted from Haiti. She and her husband made four trips to Haiti over a two year period before being able to bring their daughter home. She described a slow, unwieldy government process with complexities and unforeseen stumbling blocks at every step in their journey to adopt. Once a family is “in process” to adopt internationally simply switching countries is not typically a viable option (unless the adoption agency you select also represents that country and, even then, you must still resubmit paperwork and redo portions of your home study). The I-800a, which is the request to the U.S. government to adopt an international orphan, asks prospective adoptive families to specify: country, gender of child(ren) and age of child(ren). 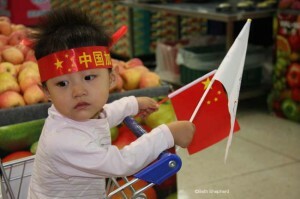 If a family says: China, girl, infant, the only way to change that is to update a home study or, in the case of country change, redo the entire home study and supporting paperwork before submitting a new I-800a to U.S. Immigration (USCIS). Of course, submitting a new I-800a is $830 for a couple and that’s just the I-800a, never mind a new home study and all supporting documentation. While some of the regulations might seem to keep families from adopting, most are in place to protect prospective adoptees. We are adopting from Armenia, a Hague Convention country. In part, this means that all children available for adoption have been placed on a registry, giving extended family a chance to step forward and offer to raise this child. Imagine a child in Haiti, separated from family and then adopted to a family in the U.S., when there is an aunt or uncle in Haiti who might willingly take that child in, if they knew he was in need. Or consider the possibility that a mother or father might “sell” their child for emergency rations or medical care, a situation that has occurred in other countries and resulted in the U.S. ceasing to allow further adoptions to be processed. Acting in haste to find homes for children of disaster can open the door to a host of new, equally troubling scenarios. While it’s heartening that people in the U.S. are thinking more about Haitian orphans in need, the truth is that, worldwide, there are children living in horrific circumstances. Hunger, homelessness, abuse, war, disease and natural disasters befall hundreds of thousands of children in countries around the globe, including the U.S. I want to believe that the flurry of interest in Haitian adoption isn’t just a result of jump-on-the-cause-du jour bandwagon. Haitian orphans need help, no doubt, but so do orphans in Vietnam and Guatemala (two countries which the U.S. currently has closed to international adoption), as do orphans in Sudan (adoption not allowed for Moslem children), as do children in a host of countries that the U.S. does have agreements with. The list of children needing loving permanent homes is endless. If something good can come from all the death and despair in Haiti, I hope it will be to widen the net of families who might consider adoption from a range of counties (including the U.S.), and who are prepared for all that’s entailed to make it from square one to bringing a child home and then raising that child. When all is said and done, and the fallout from this disaster passes, there will be another and then another. Adoption is not for the faint of heart, nor those in a big hurry. It isn’t meant to be a panacea to assuage the guilt we might feel as we watch the tragedy unfold in Haiti. Adoption isn’t just for the time being. Adoption is a life-long, life-changing decision, because the child you adopt becomes your child for a lifetime. Inky blackness greets my eyes as I step outside our hotel’s front door. My skin prickles from the intense sharpness of the cold air. As my eyes adjust to the darkness, I can see millions of stars filling the darkness, like a Pointillist painting. The Milky Way spills out in a cloudy haze. I feel so small, just one speck of life. 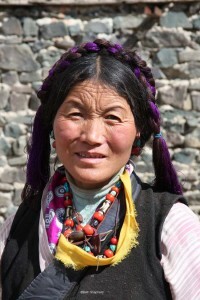 My husband, Big Papa, and I are spending the night at a hotel in Tingri, Tibet one stop in our trek from Lhasa to Mt. Everest base camp. Tingri has a population of approximately 523 and is at an elevation of 14,107 feet. The elevation combined with the pure, unpolluted skies gives us a view of our galaxy we’ll never forget. I’m sure if I just stretched my arm out an inch or two farther, I could touch the stars. What a difference a seven-hour plane flight and a couple days of driving makes. Our journey began in Beijing. Traveling from this sprawling, polluted metropolitan city to Lhasa, the capitol of Tibet is a study in contrasts. As the Chinese tear down old Beijing, in its stead an uber-modern sterile hulk of a city rises out of the destruction. Change is afoot in Lhasa too, and some years from now, it may bear little resemblance to its former self. But once the city of Lhasa disappears over the horizon, the Tibet which emerges has remained unchanged for thousands of years. The feeling of being in a place where the sights, scents and sounds are as ancient as time itself reverberates deeply inside my soul, like the rich bass voice of the monk chanting at Tashilhunpo Monastery, where we’d stopped just the day before. Like most of our trip, the previous day’s drive to Tingri could only be described as surreal. We’d just finished a filling lunch in Shigatse and had been on the road for about a half-hour. A short distance in front of us, we see several trucks pulled off to the side of the road and a gathering of people. Tenpa, our Wisdom Tours guide, tells Chimi, our driver, to pull over so we can see what’s going on. In the middle of a circle of local farmers and villagers we see a bald-headed, burgundy-cloaked Lama: not exactly what you might expect to see in the middle of the countryside. We sit and stare from safe distance for, a few minutes the Lama until notices us and waves us over to join him. We don’t know what to do, but Tenpa encourages us to go, so off we tromp across the field. “Welcome. Please sit down,” the Lama greets us in clear English. He motions us to sit, on the ground, in the middle of a group that has gathered around him. 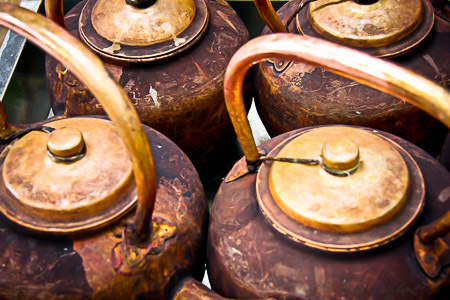 Several monks appear with thermoses of hot water and hot water only. We aren’t sure why we don’t rate a serving of tea. Plates piled full with momos: dumplings with yak meat and vegetables inside, are being passed from person to person. Our lunch is still warm in our bursting bellies, but when you’re sitting in the middle of a field in the middle of nowhere in the middle of Tibet at the invitation of a Lama, what are you going to do? So, we eat and chat with the Lama, feeling very conspicuous amongst all the local townspeople and the Lama’s entourage, whose impromptu roadside assembly we interrupted. The Lama speaks English quite well and tells us he now resides mostly in Italy. We share that we have traveled all the way from Seattle, Washington in the United States. It feels other-worldly to be chatting with a monk while munching on momos in the midst of the Tibetan wild. Tenpa and Chimi stand, looking uncomfortable, a short distance from the gathering. Fifteen or twenty minutes pass before we excuse ourselves. Whether our hasty retreat is perceived as rudeness, we don’t know, but we feel torn between our allegiance to our guide and whatever obligation we unknowingly entered into by accepting an invitation to share a meal with a Lama. Heading down the road once again, Chimi deftly speeds around the curvaceous mountain passes without a moment’s hesitation, swerving within inches of precipitous drop-offs. Big Papa and I sit in the back seat of the Land Cruiser. Our eyes wince with each close call. Tenpa reassures us that Chimi knows exactly what he’s doing and besides, he tells us, it’s only the “crazy Chinese drivers” who get into accidents. Tenpa starts talking and shares his opinion of the Lama we’d just met. He says he knows of “this Lama” and believes the Lama’s reputation is one of ill repute. He describes shady and politically-tinged quarrels between the Gelug, or Yellow Hat sect, the sect to which most Tibetans and the current Dalai Lama ascribe, and this Lama. Supposedly, this Lama broke from the Gelug sect and tried to form his own sect and followers. From Tenpa’s perspective, this Lama was not a “real” Lama. Big Papa and I are a bit confused. Why pull our truck over to the side of the road and encourage two naïve Westerners to dine with a Lama if the Lama was of dubious distinction? Our experience feels a bit tarnished. We ponder this turn of events, and our guide’s interpretation, as we venture higher and higher through mountain passes. 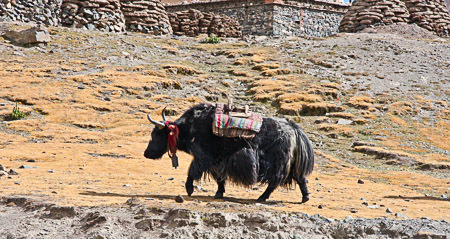 Nomadic herders guard their yak and sheep, their forlorn and isolated tents perched on windblown precipices. Tiny villages, a dozen huts strong, pop up every so often in the formidable landscape. No one who lives in this remote and rugged terrain escapes the harsh hot summers or the endless frigid winters. To survive in this place speaks to the incredible tenacity and strength of the people who call the mountain regions of Tibet home. Pulling off to the side of the road for one of our now infamous “nature toilet” stops, we are greeted by two children. They come running across the highway from their small village of eight or so homes. Their faces and clothing are dirty and they peer at us with eager curiosity. Soon they are joined by an older woman. Her face is lined with crevices as deep as the chiseled mountains that loom behind her village. Tenpa interprets for us and we have a short conversation. She asks us where we are traveling from and what we do. I try to imagine Big Papa explaining software development to a woman who has spent her entire life in a remote Tibetan village at 16,000 feet. She tells us she is 44 years old. I blink and attempt to absorb what I see versus what I hear her say. At nearly five years her senior, I look decades younger than she does. I feel guilty about the many privileges I so easily take for granted. The conveniences and wealth of in our westernized lives are likely unimaginable to this woman. By U.S. standards, our house at barely 1000 square feet is a tiny cottage. Yet, our humble home could encompass most of this village. Before we depart, she asks if I would like to buy her silver waist belt. I am tempted but Tenpa tells us she is asking too much for it and we can get a cheaper price at a market. True, I think, but not with this story. I feel a bit regretful that I pass on her offer, but as we walk back to the truck, I see something sparkle in the dusty earth. It’s a crystal, a lovely gem possibly created in this spot where I stand. I pick it up and tuck it in my pocket, running my fingers over its smooth edges, happy to have a memento to mark this moment. From Tingri, we make our way to Mt. Everest, or Qomolangma as the Tibetans refer to it. Qomolangma means Goddess Mother of the Universe, which is quite appropriate if you ask me. The scale in the Himalayas is difficult to imagine. Earlier in the day, when the mountain was completely covered in cloud, I pointed out a smaller peak on Everest’s flank to Big Papa, thinking it was Everest. It could have been: it was a sizeable mountain in itself, maybe 22,000 or so feet tall, with its own snowline, ridges and summit. It stood well apart from everything around. 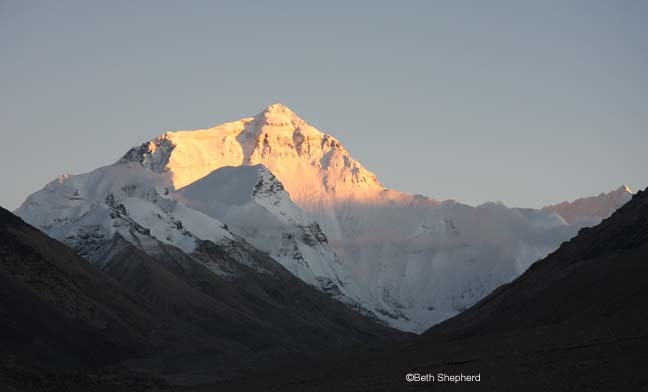 But come late afternoon, the clouds began to clear, and the upper slopes of Everest hove into view. Standing at base camp, at nearly 17,000 feet elevation, you realize how massive a peak it really is. We were already very high, but Everest’s summit towered two miles above us, and it seemed above everything else as well. You hear about Everest being an “easy” climb, with hundreds of tourists led up it each year. While that is the case, standing there and seeing both the ridge and the “step” that Tenzing Norgay and Edmund Hillary made their way up in 1953, and seeing the very high ridge where George Mallory and Andrew Irvine were last seen making their way towards the summit in 1924 before disappearing into clouds – probably clouds much like we saw that day – one gains a new appreciation for the immense effort and imagination it must have taken to make those early attempts. Everest might be “easy”, but it commands respect, even from those just sight-seeing like we are. After a couple hours of studying the mountain and thinking these kinds of thoughts, we tuck into our rock-hard beds at the Everest Hotel, without a working squatting toilet, showers or heat. One of the most memorable moments on our trip occurs as we return to Lhasa from Everest the next day. Passing through Shigaste for a second time, we stop at the Gyatse Monastery. 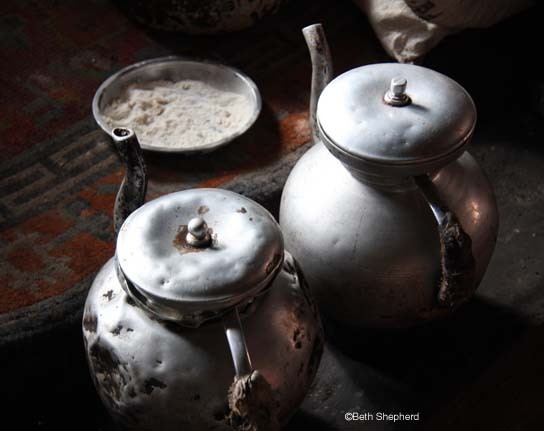 A few of the monks ask us to join them in conversation over a hearty cup of yak butter tea. Tenpa, Big Papa and I stand in the center courtyard chatting with them. Big Papa’s beard has been the subject of much attention during our Tibetan travels, especially amongst the monks. One of the monks asks if he can touch it and Big Papa says yes. The monk reaches out and, with a huge smile and much amusement, loudly growls “Ruff, ruff, ruff,” as he grabs the hair on Big Papa’s chin and gives it a thorough scruffing. Do beards remind Tibetans of dogs? We don’t know, but he is obviously having a great deal of fun. As we leave Shigatse, Big Papa and I hunker down in the back seat of the truck, giggling. Regaling each other with our favorite stories from the trip, we recount our lunch with a Lama and the beard scruffing incident. We have visited soulful monasteries and have seen spectacular vistas, yet the memories that made the most indelible marks, are those where our lives touched the lives of others. In Tibet, it’s not just the altitude that takes your breath away. How many times in one’s life will two city slickers from Seattle have lunch with a Lama? Not many. Adoption is not for the faint of heart. Navigating the twists and turns that you expect to encounter sounds relatively straight-forward at the onset. You figure you’ll gather this form and that form, find a few people to say nice things about you, get some fingerprints, pay a few fees, wait awhile and, voila, parenthood. You expect there’ll be a lot to track and do, but that it will be doable nonetheless. Anyone who has been down the road to adoption, particularly international adoption in a “post-Hague Convention” world, knows that the reality is something else altogether. Not to mention traveling this path while trying to retain some sanity. 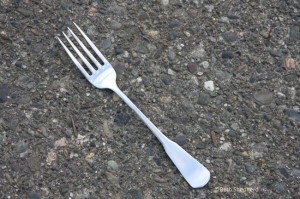 This week we reached another fork in the road. Our agency informed us that while things are still moving in Armenia, they are moving very slowly. Emphasis on very. Since implementation of The Hague Convention, which sets forth guidelines and procedures to prevent abduction, exploitation, sale, or trafficking of children, international adoption has slowed to a snail’s pace. We hear that adoptions in China are now taking 37 months, after dossier submission. The U.S. has closed the door, indefinitely, for several countries that are not “Hague-compliant,” such as Guatemala and Vietnam . We were proud to choose a country that is Hague-compliant and happy to find a reputable agency that is also Hague-accredited. But I will tell you that it has been a wild ride. International home studies required child abuse clearances from each state we’d lived in, which between Big Papa and I was nine. Hague was newly implemented in April, and states were changing policies right and left. We filed and re-filed our California clearances three times. Colorado returned Big Papa’s clearance, along with the check for $15 he’d written on August 15. They had raised their fee to $30…on August 15! Then, just as I was about to send our home study to USCIS (U.S. Center for Immigration Service) along with our I-800a (U.S. government for permission to adopt an international orphan), I noticed our home study agency’s notary had a nearly expired license. Two more weeks passed before finding a notary whose license would be good for at least six months, and our home study was revised and reprinted. Pre-Hague, waiting times for I-800a approval had been 30 days. We began hearing that I-800s were being rejected for a multitude of revisions needed, and the process was taking upwards of four months. Submitting ours with a notary whose license might expire in that time period would not be a wise step. Now that we’ve learned that the process is going to take longer than we first thought, what do we do? Cross our fingers and hope that this will be one long hiccup but we’ll still “get there?” Abandon Armenia and try for another country that our agency represents? Change our parameters for the type of child we’ll consider? My head is swimming with questions and uncertainty.